The arbitrator’s decision in the matter of the “no contracting out clause” in the contract between the Town of Deep River and the Deep River Professional Fire Fighter’s Association was released in early December. Read the Arbitrator’s Decision here. My notes from the public arbitration hearing held on October 6 and 7, 2014 are available here. 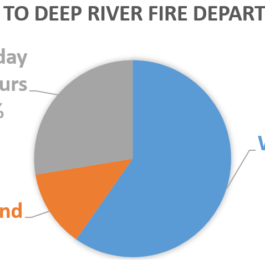 More information, including my discussion of the situation as it was prior to the hearing is available on the post: Deep River Needs Volunteer Firefighters. How you respond to the recent arbitration award with respect to the fire fighters association may be the most significant financial decision you make during your term. The “no contacting out” clause was awarded in 1984, and only 30 years later have circumstances aligned to produce some movement on the issue. Depending on your response, we could be stuck with high costs for another 30 years. I would give the arbitration board credit for recognizing that the employer ought to have the right to use volunteer fire-fighters. I give them credit for considering how the contract limited us from having a sufficient number of firefighters to provide adequate fire suppression. Yet the arbitration award diminishes hope of achieving a fire department that is both cost effective and adequate. The award does not reflect the fact that our costs are already double what they should be. Nor does it seem to replicate the results of free bargaining, which usually forces a compromise. Instead, the award is nearly identical to the Association’s position during the public arbitration hearing. In contrast, the town’s position was that in exchange for the ability to use volunteers, it would protect the existing staff and reduce the numbers only by natural attrition. During the election, most of you spoke favorably of transitioning to a composite fire department using attrition. But under the award, if you hire even one volunteer firefighter, you must give up your power to reduce the number of full time firefighters completely. That would be an unacceptable loss of taxpayers’ ability to control their costs. But you have other options at your disposal. You can consult with legal counsel about challenging the decision, perhaps on the grounds that it may not comply with the legislative requirements to consider, among other things, the taxpayers’ ability to pay. You can seek to negotiate further changes in the contract language in the next round of bargaining, as the newly awarded contract will expire at the end of the month. You can exercise your right to cut costs – before that right disappears. If we can’t have an adequate department at $1,400,000 per year, we might as well have an inadequate, but much more cost-effective department at half that amount by reducing the size of the department. With the money saved, we could put sprinkler systems in every home, and increase prevention programs and enforcement of fire codes. We would be safer than we are today. You can even stop providing fire suppression. Because the contract would not apply to a fire service that does not involve the Corporation of the Town of Deep River, the community could organize and fund its own fire-suppression service using volunteers. As the first such community fire service in Ontario, it might inspire other towns whose citizens feel helplessly bound by unreasonable contracts upheld by an arbitration system that does not respect their interests. But whatever you do, don’t rush this decision.